I think a lot of it is just a philosophical difference with the situation so because of that, feeling tiredish, and it being Christmas, I'm going to drop most of the discussion. I was going to suggest we do the same. Well, I don't really think it's an injustice more so than I think he was done dirty and he has a right to be upset and stand up for himself and the situation. Brady Quinn can be upset all he wants too. This is going to be a domino effect that will pull in 4 new QBs to this situation next year! I've asked the same question. Discussion Conclusion: Ricky Stanzi should start at QB for the 2013 Jacksonville Jaguars. Yeah when it happens, just take my sig now and replace Chad Henne with Tim Tebow. I'm already working on the Jorts to Shorts sig. Tebow is 9-7 as a starter including playoffs. I think Tebow has to realize that none of the 32 teams want him, at least as a QB. It's all owner led when it comes to acquiring Tebow, both by the Jets and Jaguars. Aaaand Tebow sig for me, too. How is Tebow the savior Rex lobbied all off season. Got the guy and saw him up close and personal and wouldn't let him on the field because he knows what the rest of the league knows the guy can't QUARTERBACK. Last year the stars just aligned for Tebow damn near every week he played a team the team he faced had a injury to player on the team he faced that enabled him to edge out a victory.. That game against Pittsburg was complete and utter arrogance it is the only reason they won that game the heavy blitz scheme pitt played in that game was terrible they blitzed heavy against a descent Oline and got exposed.. When they Played the Pats they played them straight up soft zone and blitzed when they got him down in distance if you play Tebow straight up he's a bum the NFL is not SEC... and you don't have Percy Harvin running 10 yard slants catching them and going 60 yards against inferior corners. Its also funny how when he was in Denver his team mates talked so highly of Tebow and when he left they pretty much said he was a fluke. Tebow led Jaguars could be more talented than the Andrew Luck led Colts. Oh dear. 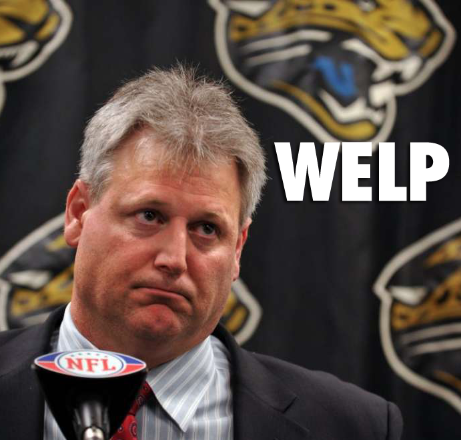 Not a chance the Jags win more than six games with Tebow at the helm. They would be better off with Chenne. Tebow led the Broncos to the playoffs with one of the strongest strength of victories. I'd go into depth about the fallacies you're using in your arguments but I already did that and you still didn't understand so it'd be pointless. So, iPwn, before you attack, just know that. You make it seem like this kid has never been given an opportunity. What about his time in college? Urban Meyer broke promises to Cam Newton to keep Tebow the starter. According to every source to come out of that season, Newton completely outplayed Tebow in every facet of the game heading up to the 2008 season, but still he wasn't given a shot because the golden boy was there. And I know Newton can be a touchy subject around here because of how he left Florida, but that's simply the facts. The folks at the Senior Bowl changed the offense that he was to run because he was incapable of taking snaps from behind center. The whole situation with Manning wasn't just that Manning was great and they would be remiss to not get him, it was the Broncos trying desperately to find any QB they could use in place of him. Think about that for a second. How many playoff winning QBs are put in a situation where the franchise is doing everything they can to replace them?